…in honor of the careers of Frederick Asher and Catherine Asher, and their innumerable, generous contributions to the study of South Asian and Islamic Art. 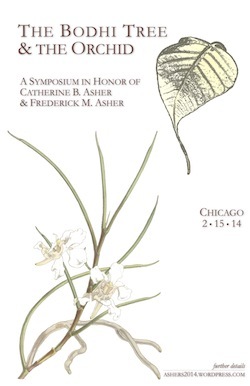 On February 15, 2014 in Chicago, please join us for a day-long symposium followed by a celebratory dinner to toast the Ashers. A focused commitment to questioning canonical epistemologies anchors the study of South Asian and Islamic art at the University of Minnesota. Questions raised in intellectual debates there acknowledge and explore the porosity and artificiality of disciplinary, regional, and sectarian boundaries. Such recognition has fostered new approaches to the built (and unbuilt) environment, patronage, relations between media, the circulation of objects, ritual and bodily relations to art, and the intertwining of art and politics. In honor of Frederick M. Asher and Catherine B. Asher, this day-long symposium brings together the work of sixteen scholars who continue the legacy of the Ashers in these intellectual directions. 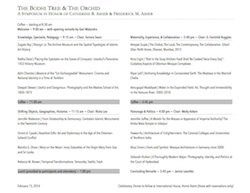 Both the Bodhi Tree and the Orchid have been part of the Ashers’ lives, teaching, and research, and they serve as apt metaphors for the generosity of the Ashers as colleagues and in their contributions to the field.